anomalynick « Identifying anomalies wherever they are ! Well it’s that time of year again when THE race that stops the nation is being run at 3 PM on Tuesday 6 of November 2013. In my opinion based on disclose form it’s one of the most open fields in years with the invasion of so many international horses. Some have excellent credentials but the question is can they adapt to Australian conditions in time. With the cost of bringing a horse to Australia estimated to be between $200,000 and $400,000, one would think the owners would not take the decision lightly. But still they come ! This year there are only 5 locally bred runners (Super Cool, Fawkner, Hawkspur, Dear Demi and Ethiopia) in the field of 24. Historically they haven’t performed very well but in recent years this has started to change. Trainers are becoming more aware of cup preparation and the need to get it right to have any chance. Bart Cummings has always maintained that it was the miles in the legs that won him the Cups, but if Frequent Flyer miles has anything to do with it then the Aussie contingent have no chance. How can a “newbie” punter make money on the Cup ? So what is my suggest Play Of The Day ? Step 2 – work out every runner in the cup that you have some sort of affiliation with and that you think can win or run a place. You can use your birthday , your mother’s birthday, your father’s birthday , your children’s birthday, the dartboard, car number plates. But then trim your selections to your top 10. Step 3 – download TAB Probet Lite from www.tabprobet.com.au. This is a free product being supplied by TAB Corp. It features my very smart (if I say so myself :-)) “probability slicing” algorithm which allows you to take many many combinations and bet them in proportion to their odds. Step 4 – Bet on the Melbourne Cup Trifecta by combining all of your selections using the Dutchbook flexi bet method. Tick all of the selections that you want to take (Note: tick the “Box” box to take your selection for 1st 2nd 3rd, or just tick the positions you want) and enter the total outlay you want, say $100. 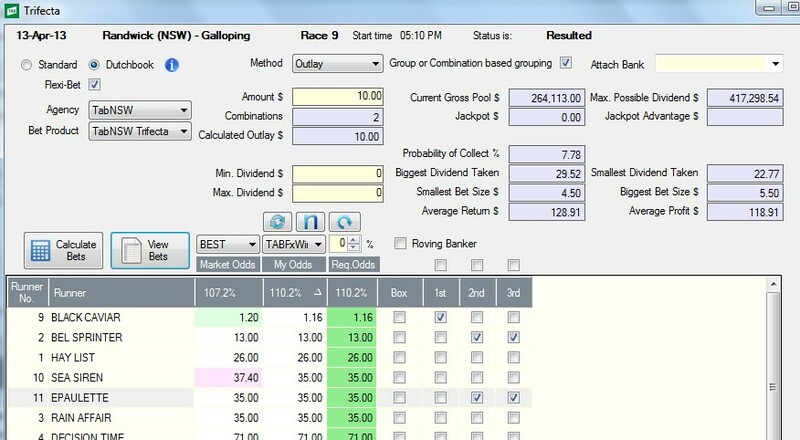 Step 5 – Press the “Calculate” button , wait a couple of seconds and then view your bets by clicking on the “View” button. If you are happy with the bet list generated then close this window and hit the “Submit” button to submit your bets. If you are not happy and want to change your bets then just modify your selections and hit the “Calculate” button again. Note that no bets will be submitted until you hit “Submit”. What are my Cup Selections ? As a said above I feel it’s as open as the Sydney Heads. 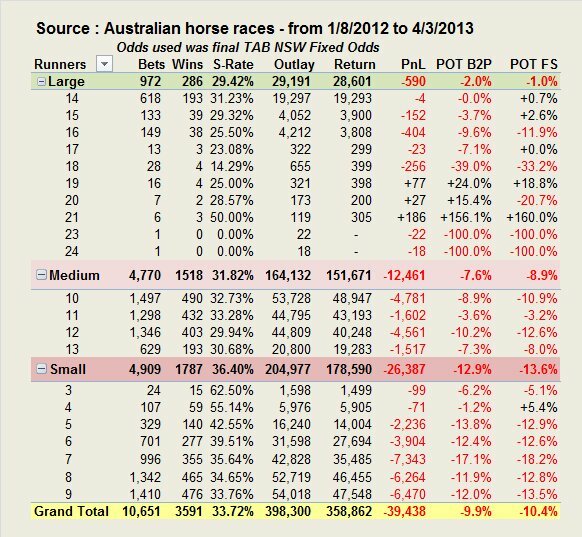 But using my Paradox of Odds algorithm (go to www.puntforprofit.com.au for details) for price assessment I have come up with what I believe to be the best value runners. My top pick is #19 Simenon from #15 Mount Athos and #7 Foreteller. So best of luck no matter what you do on the day. The MC is a great Aussie tradition. Let’s hope it keeps on keeping on ! Max Presnell, in Saturday 13/4/2013 S.M.H www.smh.com.au/sport/horseracing was very accurate in his predictions of the dangers to Nelly. Epaulette and Bel Sprinter. They ran 2nd and 3rd respectively ! But Max’s advice was to combine the 3 runners in a BOX Trifecta. Max is a very astute form assessor but to suggest taking a BOX trifecta in the mighty mare’s race was IMHO bad advice to his faithful followers. Why spend 2/3rd of your money taking combinations that didn’t include BC for the win ? 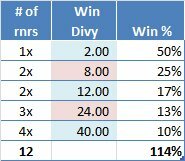 However many punters must have followed Max’s advice as the Trifecta paid a very handsome dividend of $29.30 in NSW and 10 cents less in VIC. A better approach would have been to bet just the 2 combinations (9-2-11 and 9-11-2 ) in proportion to their probability of winning. 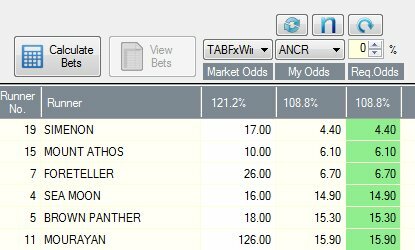 This can be done very easily using TAB Probet Lite which is a FREE betting product currently being offer by TABCORP. 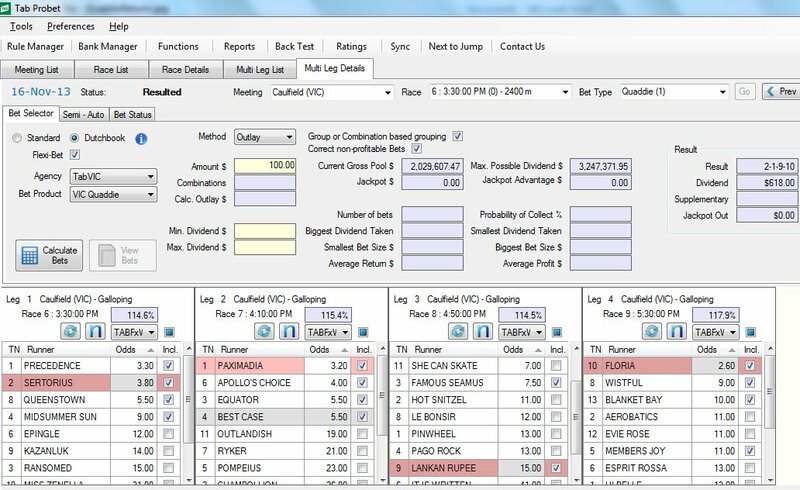 Go to www.tabprobet.com.au to download. But you had better hurry because the FREE deal probably won’t be around for much longer. So what was the advantage of NOT boxing the 3 horses ? 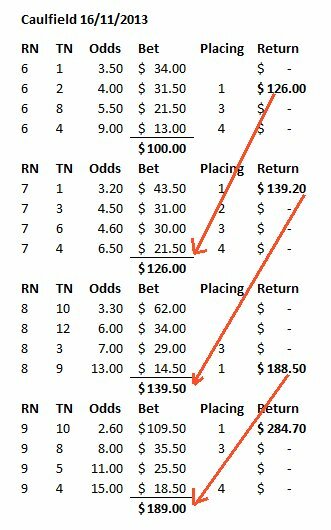 A box trifecta for $10 on 2-9-11 would have returned $48.83 whereas taking the 2 combos in a dutch trifecta paid $131.85 meaning an extra profit of $83.